The General Assistance Program (GAP) is funded by the Environmental Protection Agency, to support capacity building of the Department while maintaining a Tribal presence in Environmental issues impacting Tribal lands and members. 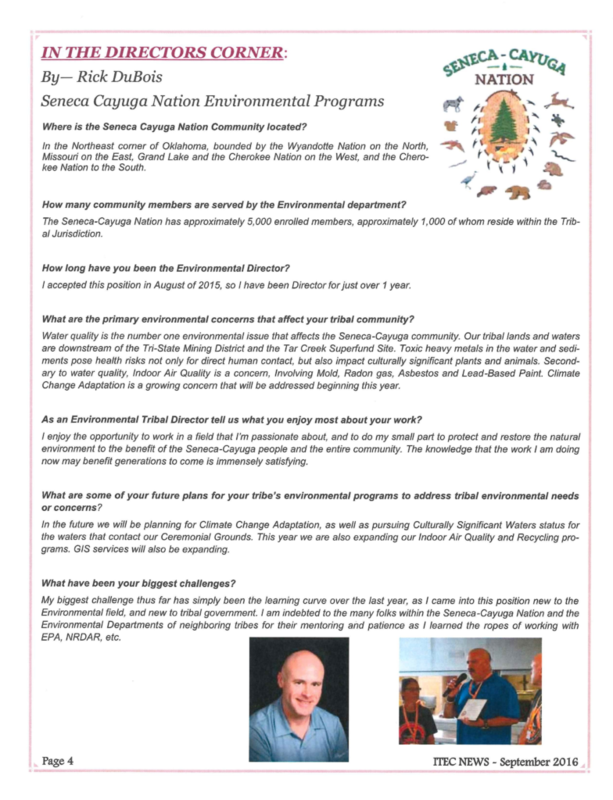 The Department is able to assist Tribal members with providing Lead Based Paint Testing, Asbestos inspections, mold inspections, Phase 1 Environmental Assessments, and continued research into other media’s that may have an adverse impact on the environment within and around the Seneca-Cayuga Nation jurisdiction. The Environmental Department provides recycling trailers for the general public to use, located at Seneca-Cayuga Headquarters parking lot and one in place at Grand Lake Casino. Recycling containers have been placed throughout the Offices for use. Items collected are taken to Red Cedar Recycling and the City of Miami. This Program is also funded by the EPA under the Clean Water Act Section 106. This funding allows for monthly sampling and monitoring of rivers, streams and numerous in-lake sites, all within tribal jurisdictional boundaries. The Department currently samples and monitors Sycamore Creek, Buffalo Creek, Elk River and Grand Lake, each month at predesigned locations. The department also completes random monitoring and testing at locations of specific concern upon request by either the tribe or tribal members. Upon request, the department will perform sampling of drinking water and water wells for Tribal members.